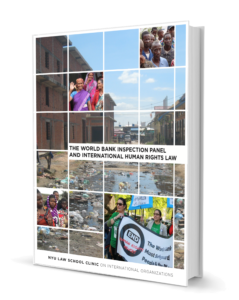 This report examines how the Panel has engaged in human rights-related claims through its past casework and how it can support the Bank’s efforts in realizing the Vision Statement included in the ESF. An analysis of the Panel’s past cases indicates a fairly consistent practice of referring to international law and human rights standards in order to ensure that individuals’ rights are protected and the development objectives of Bank-funded projects are achieved. In this sense the Panel has encouraged, and has been part of, a robust system of accountability that is both responsive to the needs of particular communities and protective of the Bank’s interests. The report concludes by arguing that the new Framework presents important opportunities for the Panel to further consolidate and develop this practice. Part I starts by situating the Panel within the context of the Bank’s institutional framework and the body of international human rights law. Part II examines the Panel’s interaction with international human rights law through an in-depth analysis of relevant cases considered by the Panel during the period of 2002-2016. These cases cover a broad range of sectors and are used to distill overarching conclusions about the Panel’s engagement with human rights. Three ways in which the Panel’s practice contributes to the protection of human rights are identified: (1) the Panel progressively interprets Bank policies and procedures incorporating human rights, with a particular emphasis on human rights due diligence and supervision; (2) the Panel refers to international human rights law and the work of specialized human rights bodies; (3) the Panel adopts a socially and environmentally sustainable definition of development, including respect for human rights standards as critical to the effectiveness of Bank projects. Part III defends the practice of the Panel arising from its operational independence, its jurisdiction, The World Bank Inspection Panel and International Human Rights Law, and the Bank’s own practice of engaging with human rights standards. Part IV considers the changes brought by the newly adopted Framework and their implications for the Panel’s continued engagement with human rights. It argues that the Framework provides greater opportunities, and creates a greater need, for further engagement with human rights derived from: (1) the Vision Statement’s explicit reference to international human rights law (2) the embedded human rights content of the new Standards and (3) the Bank’s broader policy framework, especially the due diligence and supervision obligations of the Bank.